Chip stocks are trying to climb over a wall of worry related to trade tensions, macro concerns, and general worries that the current boom cycle is in its later stages. If chip developers and chip equipment makers can put those worries to rest, a lot of them will probably look pretty cheap in hindsight at current levels. And that's particularly true if you compare them with software and Internet high-flyers that have posted big gains this year. This column has been updated from June 19th to include up-to-date price and valuation data about the companies, funds and indices discussed. After posting big gains in 2016 and 2017, the Philadelphia Semiconductor Index (SOXX - Get Report) is down close to 5% from the highs it reached in late January, following a 3% drop on Monday. By comparison, the PowerShares Dynamic Software ETF (PSJ - Get Report) is up about 10% since then, and the First Trust Dow Jones Internet Index Fund (FDN - Get Report) is up over 13%. Microchip Technology ( MCHP - Get Report) - Trades for 13 times a fiscal 2020 (ends in March 2020) EPS consensus of $7.30. Cypress Semiconductor ( CY - Get Report) - Trades for 11 times a 2019 EPS consensus of $1.44. ON Semiconductor ( ON - Get Report) - Trades for 12 times a 2019 EPS consensus of $1.96. Broadcom ( AVGO - Get Report) - Trades for 12 times a fiscal 2019 (ends in Oct. 2019) EPS consensus of $20.62. Qorvo ( QRVO - Get Report) - Trades for 12 times a fiscal 2020 (ends in March 2020) EPS consensus of $6.89. Micron ( MU - Get Report) - Trades for 5 times a fiscal 2019 (ends in August 2019) EPS consensus of $11.65. Applied Materials (AMAT - Get Report) - Trades for 10 times a fiscal 2019 (ends in Oct. 2019) EPS consensus of $4.66. Lam Research (LRCX - Get Report) - Trades for 10 times a fiscal 2019 (ends in June 2019) EPS consensus of $17.30. KLA-Tencor (KLAC - Get Report) - Trades for 12 times a fiscal 2019 (ends in June 2019) EPS consensus of $8.71. Ultra Clean Holdings (UCTT - Get Report) - Trades for 6 times a 2019 EPS consensus of $2.56. Axcelis Technologies (ACLS - Get Report) - Trades for 11 times a 2019 EPS consensus of $1.79. MKS Instruments (MKSI - Get Report) - Trades for 10 times a 2019 EPS consensus of $9.36. The old line that capital is a coward in search of security might have some relevance here. 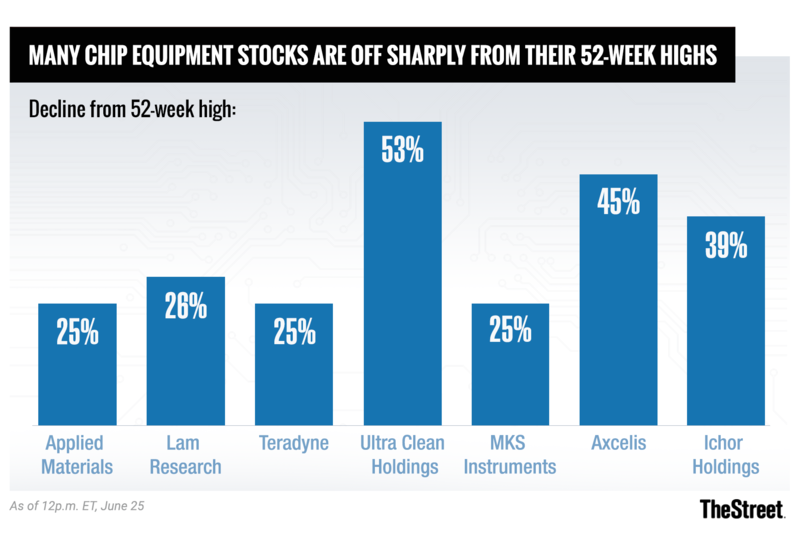 Both the chip and chip equipment industries have been very cyclical over their histories, and a mixture of industry-specific and broader economic worries have made investors nervous about a cyclical downturn. One that will lead low industry multiples to quickly inflate due to earnings declines. Rising interest rates -- driven by an uptick in inflation -- have weighed on the shares of companies in cyclical industries both inside and outside of tech. A looming trade war with China could impact chipmakers and/or chip equipment makers via tariffs, export controls and -- judging by the fact that Chinese regulators still haven't approved the Qualcomm/NXP deal -- stalled M&A reviews. Meanwhile, soft smartphone demand has weighed on shares of mobile chipmakers, and concerns about double-ordering (not the first time they've popped up) might be affecting shares of analog chipmakers and microcontroller (MCU) firms a little. Chip equipment makers, for their part, have been pressured by order push-outs from NAND flash memory makers and -- in the cases of firms with OLED exposure -- a slower-than-expected ramp for OLED adoption within the smartphone market. As Jim Cramer recently noted, investors on edge about macro issues have been partial to companies that they believe don't need strong economic conditions to grow well. That appears to be a key reason why many chip stocks have lagged, and why many software and Internet names have been bid up to lofty multiples. While it would be foolhardy to assume that industry cyclicality is a thing of the past, a lot has changed for the chip industry in recent years thanks to consolidation that has significantly reduced the number of suppliers in many markets. In memory, analog, MCUs and elsewhere, this consolidation has both given suppliers greater pricing power and created economies of scale that are unlikely to go away. The industry also still has several secular growth drivers over the next few years -- notable ones include the automotive chip market's growth, rising cloud capital spending, 5G deployments and growing IoT device sales. And with regards to chip equipment makers in particular, it's worth noting that recent NAND and OLED pressures could very well dissipate in 2019: Solid-state drive (SSD) adoption and steady increases in the amount of flash going into the average smartphone and server remain tailwinds for NAND, and OLED's technical strengths relative to LCDs leave it well-positioned to gain more ground in both the smartphone and TV markets. Economic risks certainly bear watching, but it doesn't exactly look as if the sky is falling right now. Interest rates are still historically low, and that would remain the case even if the Fed hikes rates a couple more times. Likewise, inflation, though having picked up, has mostly been under 3% in recent months. And given past attempts by both sides to find a middle ground, it's still quite possible that the U.S. and China will reach a trade compromise before too much damage is done. Provided they're confident that worst-case economic fears won't be realized, tech investors who have large paper profits in software and Internet high-flyers should consider rotating a portion of those funds into chip companies that trade at low multiples and have meaningful long-term growth drivers. It's certainly not hard to find chip stocks that fit this description.